Heiress Prudence MacKenzie is a valuable partner to attorney Geoffrey Hunter, despite the fact that women are not admitted to the bar in New York’s Gilded Age. And though their office is a comfortable distance from the violence that haunts the city’s slums, the firm of Hunter and MacKenzie is about to come dangerously close to an unstoppable killer . . . The murders in Whitechapel are shocking enough to make news worldwide, and in the autumn of 1888, Geoffrey and Prudence find the stories in the New York Herald quite unsettling. But London is not the only city to be terrorized by a mad butcher. Nora Kenny makes the occasional journey on the Staten Island ferry to work in Prudence’s Fifth Avenue house, just as her mother once served Prudence’s mother. As little girls, they played freely together, before retreating into their respective social classes. Still, they remain fond of each other. But when Nora slips away to Saint Anselm’s one chilly Saturday to confess her sins and never returns, Prudence is alarmed. And when Nora’s body is discovered in a local park, Prudence is devastated. Nora will not be the only young woman to fall victim, but the police are uncertain what they are dealing with. Has the Ripper sailed across the Atlantic to find a new hunting ground? Is some disturbed soul copying his crimes? A former Pinkerton agent, Geoffrey intends to step in where the New York Metropolitan Police seem to be failing, and Prudence is just as determined to protect the poor, vulnerable females being targeted. But a killer with a disordered mind and an incomprehensible motive may prove too elusive for even this experienced pair to outwit. From the author of What the Dead Leave Behind, this is a suspenseful and richly atmospheric mystery that captures both the elegance and sophistication of nineteenth-century New York, and the secrets and bloody terrors that lurked behind its gilded facades. 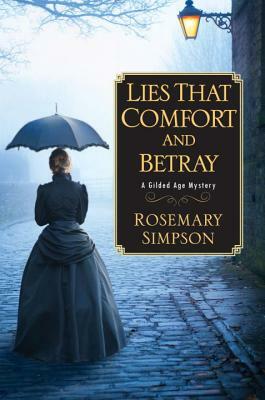 Rosemary Simpson is the author of two previous historical novels The Seven Hills of Paradise and Dreams and Shadows, and a previous Gilded Age Mystery, What the Dead Leave Behind. She is a member of Sisters in Crime, International Thriller Writers, and the Historical Novel Society. Educated in France and the United States, she now lives near Tucson, Arizona.